ESWI paper on travellers and influenza now published! Seasonal influenza is the most frequent vaccine preventable infectious disease in travellers. Yet, surprisingly, recommendations regarding influenza in travel medicine are scarce. It is therefore high time to harmonize international and national travel medicine guidelines for influenza prevention and treatment. To that end, an expert group of ESWI and ISTM (International Society for Travel Medicine) have reviewed existing flu recommendations for travellers, and listed some interesting suggestions for improvement. 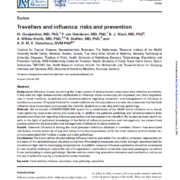 Our joint working group has now published its expert opinion paper “Travellers and influenza: risks and prevention” in the Journal for Travel Medicine. Get the full article (pdf) here.